It was a perfect day out at Hurkey Creek on Saturday 20th September 2008, where the 24 Hours of Adrenaline is held every year. My guess is that the temps ranged from low 40's over night to around 85 during the day but the Sun burnt like a hot stove when you got exposed to it. Somehow the organizers always get it right to ensure that the nights are moonless and pitch dark for most part. This year there was an 8 hour race thrown in to confuse the crowds so the start line was hot, dusty, packed and festive. The usual Chariots of Fire tune bringing a lump to any seasoned athlete's throat, and they were off! Some crazy lanky dude won the le Mans start by many yards and made it look easy. For any of you who have partaken in this maniacal start, it is something for lying down and avoiding. No matter how fit you are for biking or even how good a runner you are you will never, ever, even be anywhere near the front and will be totally anaerobic within the first 50 yards Of course if you are a solo racer like our hero Mary then there is no any sense in rushing this, as you have 24 hours of non stop entertainment to make up any meager yards lost on your opponent. There were three entrants in the Solo Ladies category so that kinda takes the edge off things a bit when it comes to getting on the podium but it was going to be a fight to the finish! Two seasoned solo veterans one aged 64 (don't be fooled by Wendy Skean... she has done more race miles on a bike than some local MTB clubs all members included. The other lady Timari Prius is the defending champ and a SIX-time winner of this event. Mary raced off into the blazing hot countryside with husband Gerry standing there with a lump in his throat and a tear in his eye with pride for his Mary. Lare Dog and I cracked a frosty and settled down for a long 24 hour vigil. 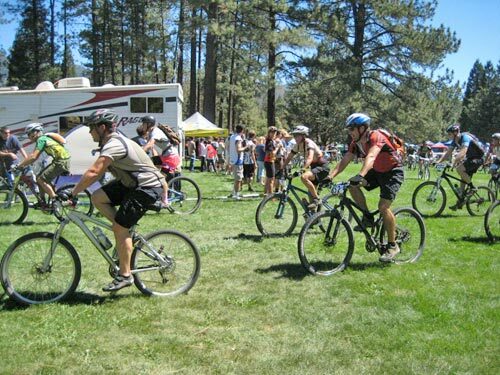 The support area was set up like the pro's and we had everything a racer could wish for including portable hot and cold showers. Mary kept a fairly steady pace through out the afternoon and managed to gain around 10 minutes on Timari and by lap 4 Timari took it back. Each rider had their share of 2 hour long slow laps, Mary's came at night and Timari's towards the end of the race. Mary came in to warm up a bit and Lare Dog noticed a nasty swollen gash on her left shin. Mary hadn't noticed it because of the cold (28 degrees). Lare dog hauled out the ol first aid kit and attended to it like the pro he is and Mary was up and outta there. All the time Mary never faltered. We had a bit of a scare when the Stan's wheels started losing air. Gerry rushed over to the Switchbanck camp and Fergus topped it up with Stan's while Mary used the backup wheel. At 6:00 am, the fun and games started. Mary was behind by about 50 minutes and we were thinking that a 2nd place was pretty good and she should just ensure that she wasn't outsmarted by the Wily 3rd place veteran Wendy Skean. Mary was on lap 12 when her tenacity and sheer guts started prevailing. She never stopped for longer than 10 minutes on any lap. Timari started taking longer breaks and sitting in the car to warm her toes. 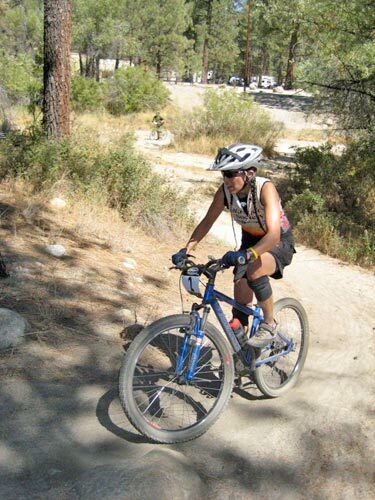 Mary chewed away slowly into the lead and eventually on the 14th lap overtook Timari in the transition area. Timari headed out for lap 15 and that forced Mary to complete a 16th as she did not know if Timari might suddenly gain some energy from some where and take the win. Timari did not start lap 16. 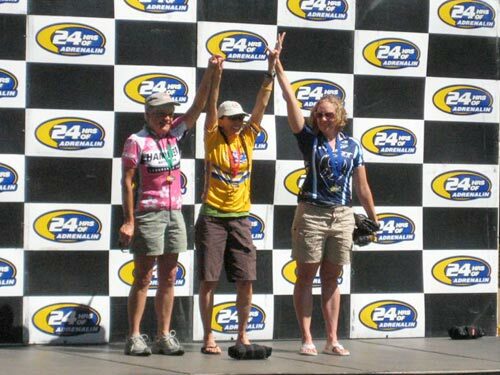 Mary did not know this and had to put in one last great effort and finally take the 2008 Woman's solo 24 hours of Adrenalin title. It was quite an experience, fun and challenging at the same time. The win hasn't sunk in yet. Overall I didn't feel too bad staying awake the entire time. I lost time on the night laps until I gained more confidence, also crashed a few times (hadn't been night riding in years). What was cool were the spectator's watching around the downhill, rocky sections, set lanterns and glow sticks on the rocks to help us guide through them in the dark... I was very grateful. Plus they cheered the riders as they came through at several different locations. I actually had an injury and didn't know it, Lare-dog helping change my socks after one late night/early morning lap to warm the feet and saw a gash on my shin that had bad swelling. He cleaned it up and bandaged and I was good to go. That's the Medic Lare-dog to the rescue. It was awesome, the 1st place solo finishers were given a complete light kit, it's awesome and I guess I'll be doing more night riding in my future. I couldn't have done it without my husband Gerry's help. He motivated me, suggested training and fueling tips, got me everything I needed before the race and allowed me time to train. I think he probably thought I was nuts, but he still ran around anyway. At the race he, Larry and Mark Cluttey were my wrenches–savior's scurrying around getting me everything I needed when I pulled into the pit. They were my coaches, fueling station, cozy blanket, pit crew, etc. I'm very grateful they stayed up for me all night long. Plus any Warrior's around and friends cheering me on... that got me through it too. Even my 5 yr son Garrett cheered me on saying "Go mommy! Are you winning?" What an experience! I'll never forget when I pulled into the timing area with half an hour to spare, Gerry and Garrett there to greet me. I wish my girls (Erika and Leija) were there too. I was actually trailing for most of the late night/early morning laps, until I gained my time back when the sun came up. I was so cold my fingers/thumb ached and my left shifting thumb was so numb and powerless I couldn't shift and had to use my right thumb instead. The numbness remained for about five days. I stopped a few times to help some riders who were stranded. One male rider was frantic in the rocky section at night and had no lights. I wouldn't known he was there until he spoke to me. He asked me to I shine my light on his bottle cage battery because it came disconnected. He was in a hurry trying to plug it back in so it took a few tries. Then his handlebar light fixture was not staying fastened either... he was getting frustrated, I thought he was never going to get it together but eventually he did and was on his way. Then lap 15, a young man off the side of the trail was trying to fix a flat and his pump broke. Hey yells," can I borrow your pump?" I said sure and told him to just use it and turn it in at the transition. Sure enough, the race coordinator walked to our camp later and returned the pump. After I came into the transition and checked in for the last time I asked how many laps I'd completed, the volunteer said 15, I thought WOW I thought I'd done 16 laps. The race coordinator again came through and checked with the timing trailer and confirmed it was 16 laps, WHEW! Yes I did go to work on Monday, I was worked though. My knees ached, I had sore muscles and my tendons above my heels were so tight and achy I couldn't walk around at work very well. I felt like an old lady who lost about 10 lbs. Today I'm finally almost back to normal and ready to do some spinning. The 2nd and 3rd place finishers (Timari and Wendy) are trying to convince me to enter the 12 Hours of Temecula coming up in November. It was an exciting feeling to be on the podium wearing the yellow jersey, I couldn't believe it happened. I was thinking the whole time I'll be happy to finish and 2nd place isn't so bad, I was ecstatic when it was a first place finish! Thanks to everyone who helped Gerry gather all the equipment. The wheel set and tires were awesome, thanks to Fergus for getting those together!